The Gold Standard in grass fed beef these days is acquiring certification from both the American Grassfed Association and Animal Welfare Approved. 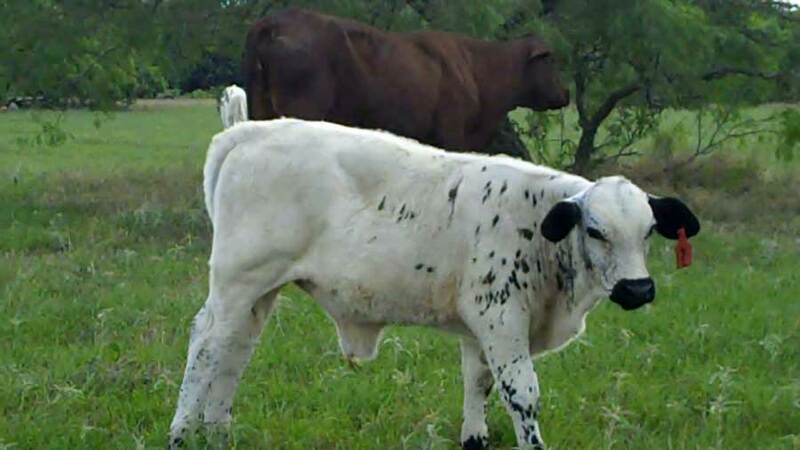 Here in Texas we have a British White breeder who has achieved both certifications -- the Lazy A Ranch in Bellville, Texas, owned and operated by Margot and Bill Heard. The Lazy A Ranch was established by the Allen (Buddy) and Ethel Carruth family, and was almost 1000 acres at one time. A herd of Santa Gertrudis cows remains with the original brand. Margot Heard has a vision, and she has the steadfastness to work toward that vision of providing excellence in healthy grassfed beef for the Houston market. 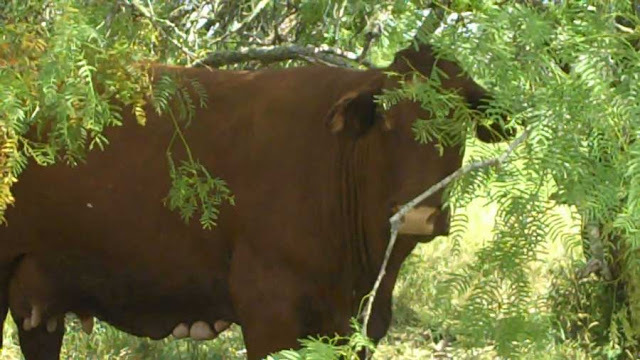 The Lazy A Ranch in Bellville has had Santa Gertrudis cattle running on its grasslands for many years, Buddy Carruth began showing Santa Gertrudis cattle in 1953 at the Houston Livestock Show and Rodeo. 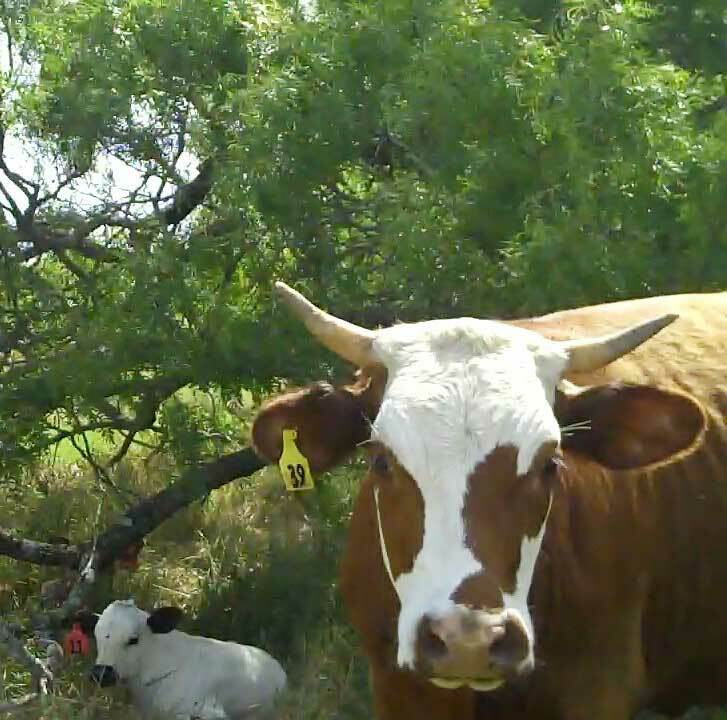 The descendants of Buddy Carruth's fine cattle still graze the pastures of the Lazy A in Bellville. 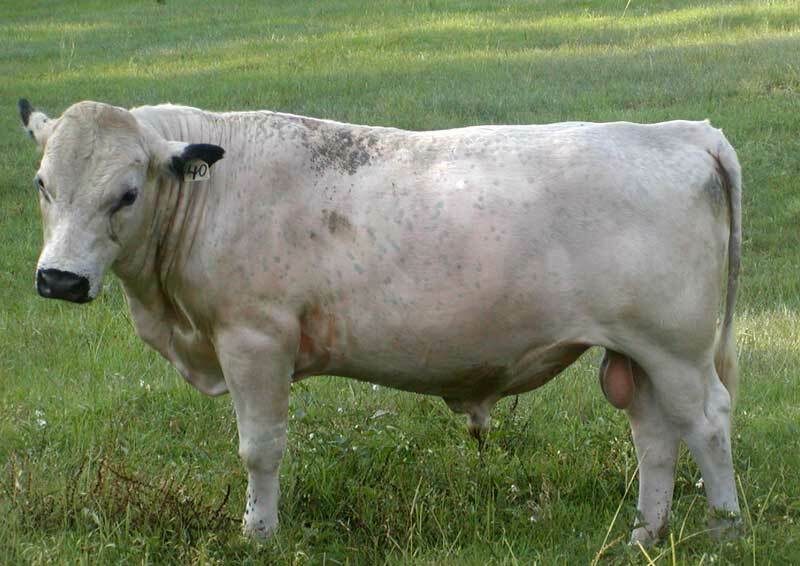 But along with this King Ranch developed breed, Santa Gertrudis, that have a healthy dose of old Shorthorn genetics running through their veins -- the Lazy A is now home to a growing herd of British White cattle. 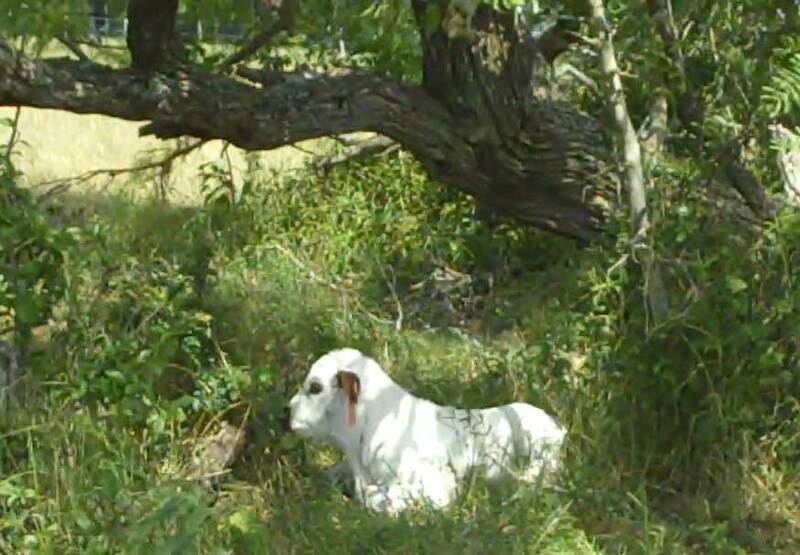 Margot has her first crop of Santa Gertrudis/British White cross calves on the ground this spring, and a growthier, healthier bunch of calves you can hardly find for many long Texas miles distant. 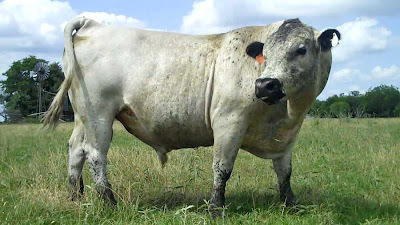 The Heard's chose to use British White bulls on the Santa Gertrudis herd that they obligingly purchased along with the ranch that the cows have for many generations called home. Their breed of choice for the long term is British White, the ancient polled Park Cattle of the British Isles; but in the meantime, they are working with their Santa Gertrudis females within the BWCAA breed-up program, along with running a good sized starter herd of British White cows. The photos you see here are from a visit to the Lazy A this past May. Were it not for my elderly dog having a really bad day, I would have much more and no doubt better shots of Margot's spring calves! But Fred was a real needy old guy that afternoon, and it is quite a trick to take video, much less still shots, clutching a shrillingly whiny old fart like my Fred can be. But I digress! 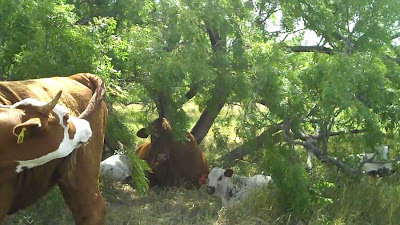 It was a beautiful herd of healthy and fit cattle with many cross bred calves at foot, and the photos here were pulled as stills from my flip video camera. 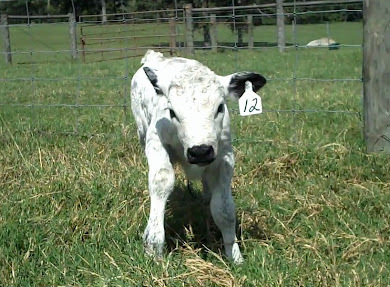 What has intrigued Margot, and most certainly myself as well, is the very large percentage of British White cross calves that bear quite classic British White markings. Having crossed with black Angus many years ago, I'd say that about 60% of all my cross bred calves were typical milk white with black point calves, and the remainder were line-backed. 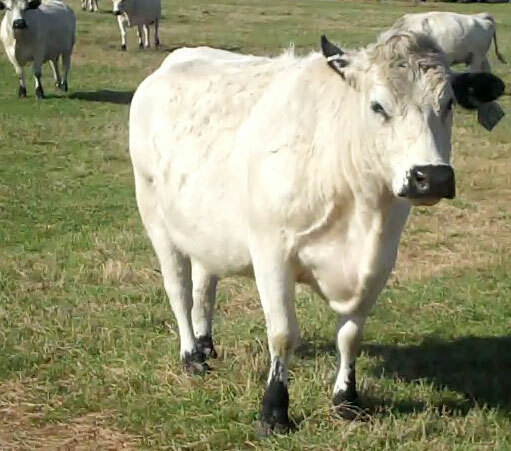 In Margot's herd, there is a predominance, approaching likely 90%, that are classic British White marked calves, as well as some with red points, despite using British White bulls with black points. Margot is interested in exploring the genetic relationship of her Gert/BW cross calves via their Shorthorn history, given the large numbers of cross-bred calves exhibiting British White color and markings. 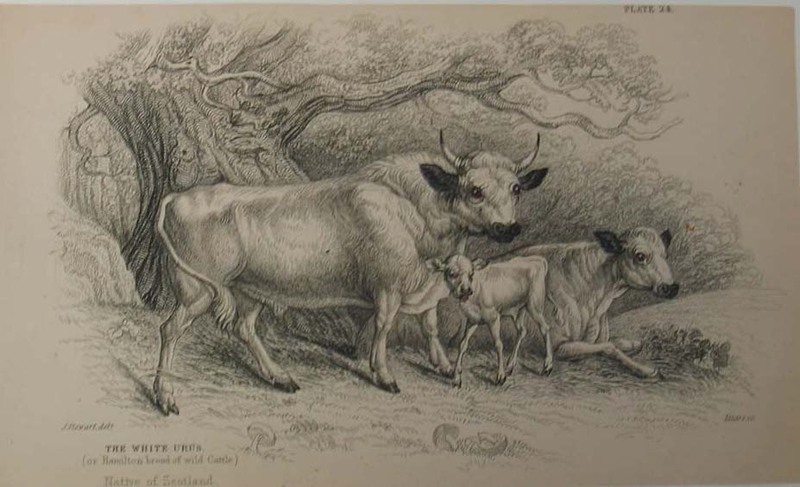 It is a clearly accepted fact in historical documents that the Shorthorn was developed long ago from the polled Park Cattle of the time, or what is known today as British White. 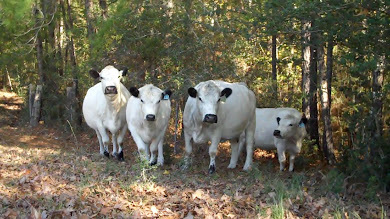 Margot was running a young British White bull, Aries (pictured left), with the Gerts for several weeks, not really anticipating that he was in any way big enough to really take care of the job, and anxiously looking about for a respectable British White bull of maturity. Well, she was instead surprised to find this Spring that her young, and even today quite moderately short of frame, Aries, had done his darnedest, and his darnedest was pretty good. (See photo above right for an Aries sired calf.) 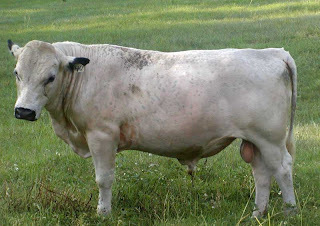 She has several calves sired by Aries, and they are very thick growthy calves that catch one's eye. If I weren't juggling too many herd bulls right now, I'd have packed Aries home with me in the blink of time it takes for a determined bull to lay down a fence and proceed! Aries is now offered for sale by the Lazy A, so give Margot a call for more details on this quite fine young bull. The next set of calves Margot had this spring were sired by Tyson, pictured left, a British White bull with excellence in Tenderness genes quite hard to find, having 5 of the 6 known genetic markers for Tenderness. Tyson is about a Frame Score 5 British White bull, and that's just a guess, not having actually measured him in a while, and he of course settled the remainder of the Gerts in short order. The calves from Tyson were younger than Aries, but certainly exhibited very good confirmation and color, and they are all the napping younger ones in the photos included here. I'll look forward to hearing from Margot how all the calves grow off between now and weaning time in the fall. The photo below is one of the very few Tyson sired bull calves that have been born. This bull, Tag #40, is out of a Popeye daughter, and has shown outstanding growth this spring. Tyson, like his sire, J.West's King Cole, has a tendency to throw mostly heifers. 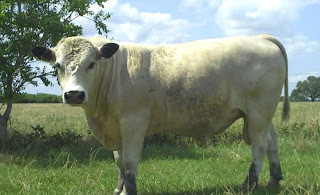 Tyson is a maternal half brother to my original herd bull, DFTX Watson, always fondly called just 'Doc' by myself and his original owner, Bob Stanley, a very fine and honest man who passed away a few years back. Tyson has much of Doc's incredibly gentle nature, but at the same time he has more stature than Doc, coming from his paternal grandsire Halliburton Colonel and paternal granddam HRH Arlene. Three of Arlene's daughters are foundation females in my herd today. Look for Margot to have some very nice British White females sired by Tyson and perpetuating his clean confirmation and Tenderness genes. 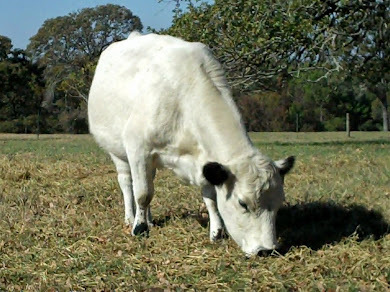 The Lazy A Ranch in Bellville has laid the ground work for producing and marketing grass fed beef. As a fellow British White breeder, I am gladdened by her efforts and hopeful for the future of our very gentle, beautiful, and immortalized breed. The carcass qualities of the British White breed have been enjoyed by the select few for many centuries, being for long periods of history the purview only of wealthy landed gentry in the United Kingdom. As well, old legend has it that the coining of the word sirloin resulted from King Henry enjoying the loin (or surlonge, the French word meaning 'over the loin') of the ancient Park Cattle of the British Isles -- and dubbing it Sir Loin. 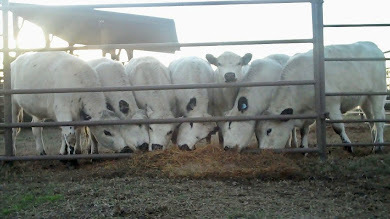 The Lazy A Ranch is now working in Texas to see the sirloin and more of the British White breed on the dinner tables of many who choose to serve their families a healthy, safe, and environmentally friendly beef product. Visit the Lazy A Ranch web site for contact information and availability of authentic grass fed beef. 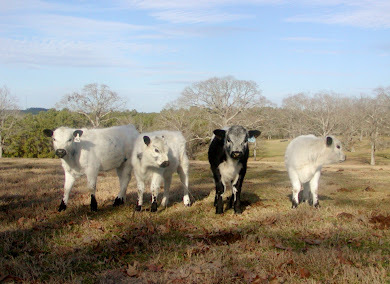 As well, the Lazy A Ranch has British White bulls and females periodically available for purchase. You can be sure that the British White cattle available from the Lazy A are in excellent health and are from the best British White genetics available. 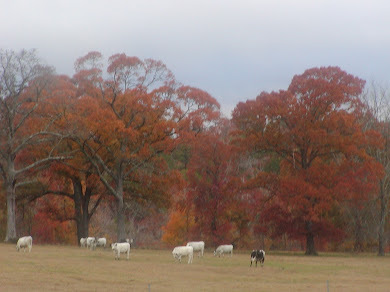 To see the cattle available from the Lazy A, visit this link, or visit the web site of the Lazy A Ranch for contact information. Pictured below is a very fine Santa Gertrudis mama cow peering under the Huisache tree, and it is her young red-eared heifer calf pictured above that she is sternly protecting.